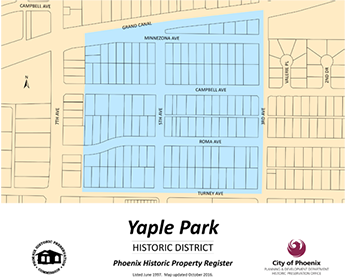 Offering tree-lined streets, an exceptional location, beautiful residences, and much more, the fabulous Yaple Park neighborhood in dynamic Phoenix, Arizona, is an excellent place to call home. Regardless of your interests, you will not struggle to find enjoyable activities to fill your free time. Whether you are interested in nature, the arts, shopping, nightlife, or something else, there will always be something new for you to discover. Fantastic Yaple Park single-family homes are ready to impress you, so now is the time to consider what it would be like to live in this exceptional neighborhood. When you are a resident of this exemplary neighborhood, you will have many opportunities at your fingertips. For example, if you enjoy spending time outdoors in the Arizona sunshine, then you will appreciate the proximity of wonderful parks and natural areas. Imagine enjoying an exhilarating hike, a relaxing stroll, an invigorating bike ride, or a delicious picnic lunch. As a resident of lovely Yaple Park, these attractions can easily fit into your everyday life. When you are ready for a quick change of pace, simply travel a short distance south to experience everything that Phoenix’s lively downtown has to offer. Envision dining in one of your favorite restaurants before attending a captivating live performance or an exciting professional sports game. You may also choose to tour an interesting museum, browse an impressive art gallery, or shop in eclectic boutiques. When the sun sets, the fun will not have to end. Instead, you will want to stay in the area to experience the thriving nightlife scene. No matter where your adventures lead you, you will be content to think of your majestic Yaple Park single-family home waiting to welcome you home. An unparalleled location, stunning landscaping, a friendly community, and ample opportunities are only a small sampling of the benefits of living in this marvelous neighborhood. Attractive Yaple Park, Phoenix, real estate options are ready to pique your interest, and you are sure to find something that suits your style. If you are ready for more information regarding gorgeous Yaple Park, Phoenix, single-family homes, please do not hesitate to contact us.